II, WI3/4, 75m of ice. Route descriptions for some of the ice climbs in the Bow Valley including the Canmore, Banff, and Lake Louise area. 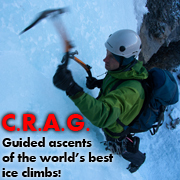 Tons of sweet deals on ice climbing & outdoor gear! These deals change all the time so check back regularly. Prices are in US dollars.